Price includes choice of Thomas Kinkade frame. "It may surprise you to learn that my colorful Blossom Bridge began as a location painting in Ireland! During a recent trip to the Emerald Isle, I came upon just such a scene as this, where ancient footpaths wind their way over an old stone bridge to a distant village. The only difference: the landscape was a solid carpet of green. Simply to introduce some variety - or so I thought - I began to add brightly colored flowers. Suddenly, the blossoms seemed to take over the canvas, resulting in the riotous profusion of hues that meets the eye in Blossom Bridge. An idea bloomed along with the canvas; I would create a place where blossoms reign. You can see the scenic little village of Blossom Lane in the distance; what you can't see are the lavish floral displays that await visitors to this blooming paradise. It strikes some friends strange that an ardent hiker and outdoorsman like myself should respond so strongly to flowers. But people can have many loves. I hope you will cross Blossom Bridge with me to a place where flowers are always in bloom." 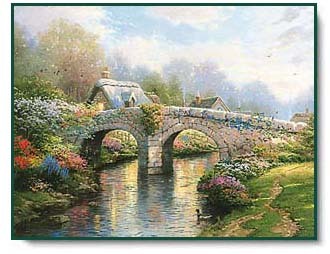 Blossom Bridge copyright © 1995 by Thomas Kinkade.